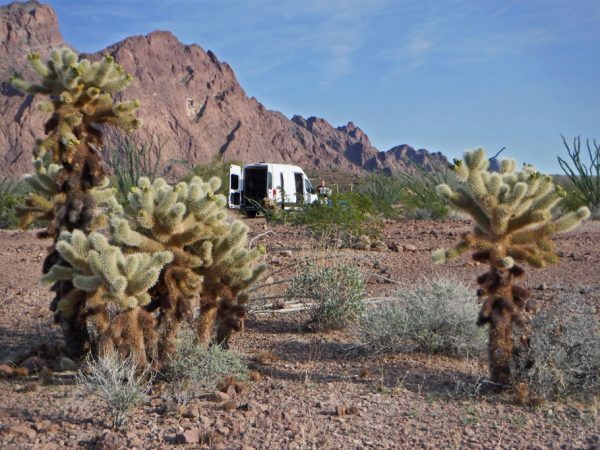 Camping free in the Kofa National Wildlife Reserve in Arizona November 2018. February 1, 2018 – January 31, 2019. 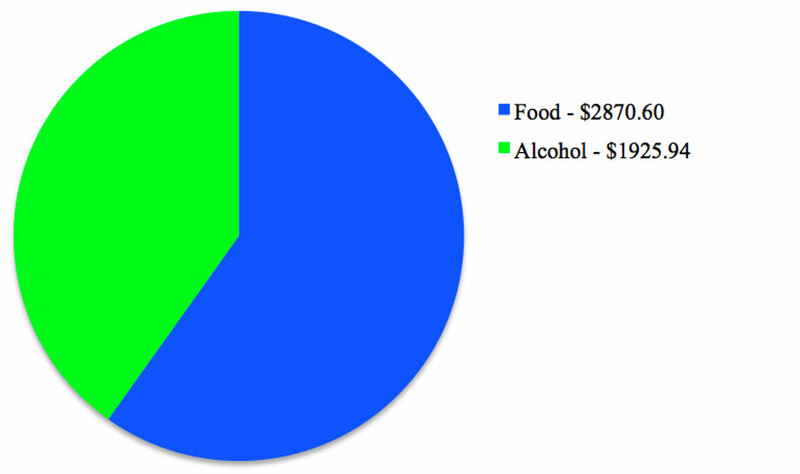 The end of this past January was the one year anniversary of our first year of tracking expenses. When we decided to go nomad about 7 1/2 years ago we had no debt. We had been saving money and when we looked at our account we decided it was enough to buy a boat. We didn’t really think much at all about how much this adventure would cost us beyond that. Since we both quit our jobs we must have been thinking it wouldn’t cost too much. Our only money plan was to have more coming in than going out. I am a habitual saver so this has actually always been my plan. For the past 7 years, things have worked out pretty well even though a couple of Springs we came back from sailing with a very thin bank account. I know a few other nomadic bloggers who track their expenses and was inspired to do the same. I thought it might be interesting to know exactly where that outgoing money was going, that it might help others planning to hit the road, and hopefully, it might be awe-inspiring to everyone else about how little we spend. Not sure I have been successful at the latter. 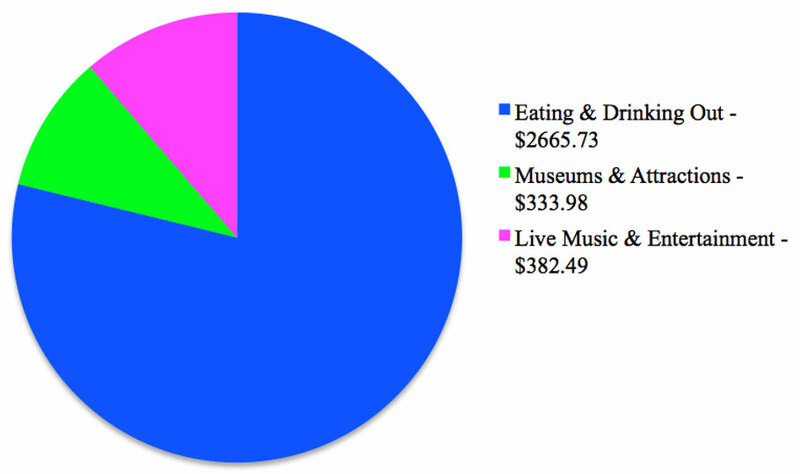 So how much did we spend this first year of tracking? These are expenses related to traveling, living, and maintaining in the van. The van, of course, is our biggest expense. 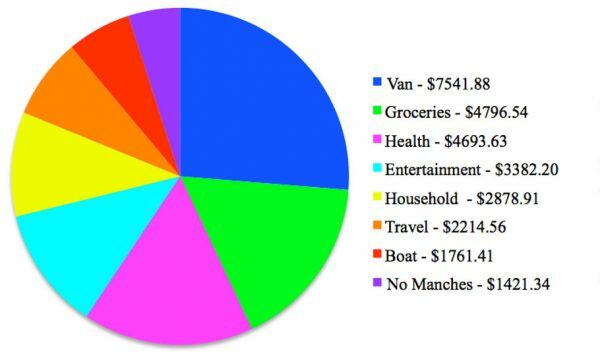 The average amount we spend on the van per month comes to $628.49. It is our home – and, well, our car – so $628.49 seems pretty darn good. Our biggest expense is gas. I wish it wasn’t so. We get about 18 miles to the gallon. Our average monthly expense on gas comes out to $331.32. It could be worse. We did lots of upgrades to the van this past year including putting in a swivel seat, buying items to organize our galley, purchasing some emergency equipment (jumper cables), and additions to create more storage. Ballena Blanca is constantly a work in progress but hopefully, there should be fewer upgrades this coming year. Our yearly car insurance is actually higher than this number reflects. I had paid our insurance ahead when I started tracking our money so the months of February, March, and April are not reflected. 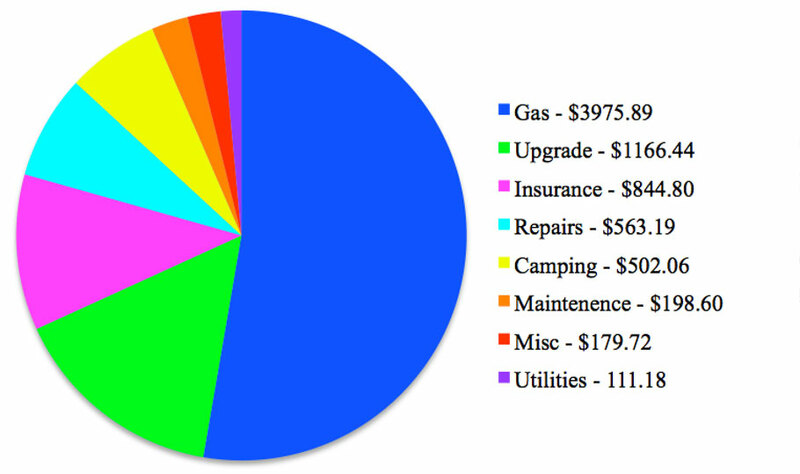 We are currently paying $96.63 for insurance every month which totals up to $1159.56 a year. We have the most insurance on our van we can afford with the lowest deductible – it is, after all, our home. We still have it insured as a cargo van – perhaps there is a benefit to having it redesignated as an RV – this is something I will look into this summer. $436.56 of the Camping Expense was spent in Mexico. This is the price of adventure. Repairs is for some work we had done on our brakes last April, Maintenance is for oil changes and tire rotation, Miscellaneous is for mostly for our tag renewal, and Utilities is for things like water, propane, and supplies we use to maintain our composting toilet. This is everything we consume that is bought in a store (as opposed to a restaurant). We are vegetarians – so I don’t know if that makes a difference, but I think we do pretty well on food. I tend to cook from near scratch – I make my own salad dressings, chili from dried beans, falafel and from canned beans, etc. I pick and choose grocery stores where I can find cheaper off-brand items. Aldi is my favorite, but there are many places in the southwest that, sadly, do know the joys of cheap food at Aldi. Trader Joes is my next go-to store. I always thought they just sold fancy prepared food, but I have come to learn they have great prices on produce and their Trader Joes brand name items are usually cheaper than the off-brand items in the big grocery stores. When we were in Tucson this past fall I discovered that Sprouts – which are very much like Whole Foods – has great prices on produce. Of course, getting produce at Farmers Markets is a good place to save money too. These are expenses that keep us healthy, feeling well, and include any type of doctor visit. Hopefully, we are through with the dentist for a while. $4,273.56 is a hefty number but it could have been so much larger if we hadn’t gone south of the border to find a dentist in Mexico. And Greg is really happy about his new teeth. The bulk of our other health expenses go to my contacts. Here is the stuff that keeps us amused and entertained when just looking out the van door isn’t enough. 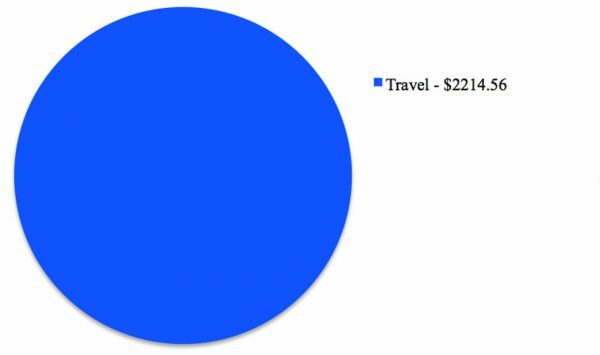 We spend an average of $281.85 on entertainment every month and as you can see from the chart above this mostly goes for eating out. When we are on the road we eat out far less than when we are house sitting in Cabbagetown where some of our best friends live over the summer. We usually have a Friday night date night when we are staying in Cabbagetown and mostly don’t need any convincing whenever a friend asks if we want to go out. I think eating out is a category where we could save more money – perhaps we need to shop around for a cheaper date night local when we get back to Atlanta this summer. 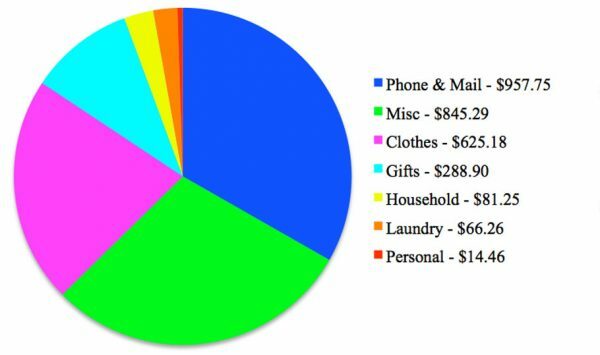 These are the same type of household expenses that one might normally have in a stationary home. These expenses also include things like gifts and personal items. Our biggest expense here is communication. We have a mail service, St. Brendan’s Isle, in Florida that receives all of our paper mail. We spent $300 with them last year – this includes the basic service of receiving our mail plus an upgraded service where they scan our mail and send us alerts when we have new mail. We pay for these services in $100 increments. Every time we have mail physically sent to us it comes out of the money we have in our account. Once the account gets low, they charge us another $100. When we began our nomad life all our mail went to my niece. But being young, she moves a bit and after a while, we just didn’t want to burden her with collecting and scanning our mail and now since we have the mail service in Florida we can claim Florida residency. The biggest problem we have with the Florida residency now is that since we no longer have a boat in Florida we no longer have a reason to go to Florida – but since we are Florida residents, we need to be in Florida to get any real value out of our medical insurance. I need to ponder the pros and cons of continuing with our Florida mail service and residency. The number I have really been interested in seeing was our phone bill. Last year we averaged $54.80 a month for phone, text, and data. About 2 years ago my phone stopped working. I had been thinking about changing phone plans from T-mobile to Google Fi, but I needed a Google Fi phone to switch. So when my phone finally bit the dust – I went ahead and purchased a Google Fi phone and switched. Google Fi charges a basic $20 a month for Calls and Text and $10 a gig for data up to 6 gigs after which there is no additional charge up to 15 gigs. I was paying $60 plus tax for my T-mobile plan which I hated – so I am pretty happy about the Google Fi plan and after two years – although the phone gives me a good scare every once in a while, it still works. Miscellaneous probably should really be paired with personal. The biggest item in that category is our inflatable kayak. We also spent money on rechargeable batteries, an external backup battery for the phone, and some cooking items. I will probably be buying some more gadgetry this year – a new external hard drive for the computer and perhaps a better camera. Most of the money spent on clothes this past year was actually for shoes. We buy most of our clothes at the thrift store so our expense there is very minimal. But as we have gotten older we have both developed foot problems and have found that thrift store shoes just aren’t cutting it. This category is for other expenses for travel beyond the usual travel expense of living in the van. We made a couple of trips to Mexico last year which came with some extra expenses – insurance, maps, tourist visa costs, and a temporary import permit for Ballena Blanca (which hopefully we will get refunded when we go back to the US). There were also travel expenses related to the selling of the boat and for a van gathering in September. For those who haven’t been following along very long, we used to own a sailboat. We sold it last year. Since we sold our boat, Blue Wing, this past year – goodbye boat expenses. Perhaps again another day. This is for unexpected expenses like our computer breaking this past December. Hopefully, we won’t see any more items in this category anytime soon. In conclusion, I see almost $10,000 of expenses that I hope not to see or that I think I can reduce in this next year – which means that we could very easily bring down our expenses to $1,600 or less every month – perhaps just a little closer to our goal of being awe-inspiring. If you are interested downloading a spreadsheet break down of all of our expenses from our first year of tracking, click here. This entry was posted in Cost of Nomading, Nomading and tagged Cost of Nomading, Cost of Van LIfe, Expenses, Van Expenses. Bookmark the permalink. I think for 2018 it was about $17,000. We always think we can do better the next year, hoping to cut down on the biggies, like a serious van problem, a new camera/computer, or plane tickets. Yet, some items always sneak up on you. And, they’re different each year, like my citizenship in 2019 and we might have an issue now with our suspension. Just as I thought our van list was getting small. I hope you’ll be able to cut out $10K. That’s a lot of money. Not owning the boat anymore is a big help. We found your insurance cost for the van quite high. It will help looking into that this summer. It’s more than ours and we have it insured as an RV in the expensive state of MA. Thanks! It is so interesting to see where it all goes. I think this will be a much more frugal year while we save money for the next big thing. I am always so impressed by how little you spend while still seeming to create a great life and have fun adventures! Google Fi sounds like a really good option. I think I need to look into that as our current phone is getting a big long in the tooth. Maybe it’s time for an upgrade. 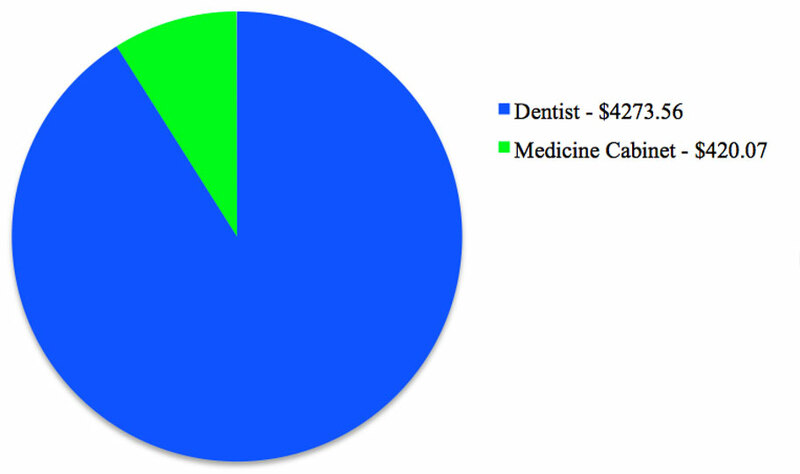 You guys did awesome on your expenses, especially when you take into account what percentage was on dental work. I, of course, stole the pie chart idea from you!